The 'Sipp' in Sippino is from the abbreviation for "single in-line pin package". 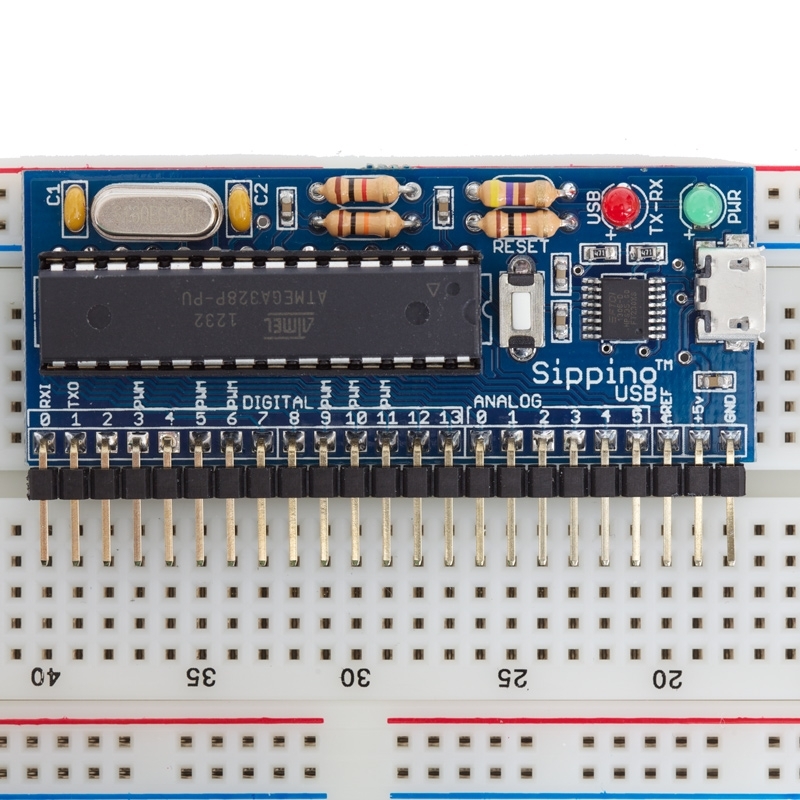 Just like the standard Sippino, all of the digital and analog pins are broken out along one edge of the PCB. 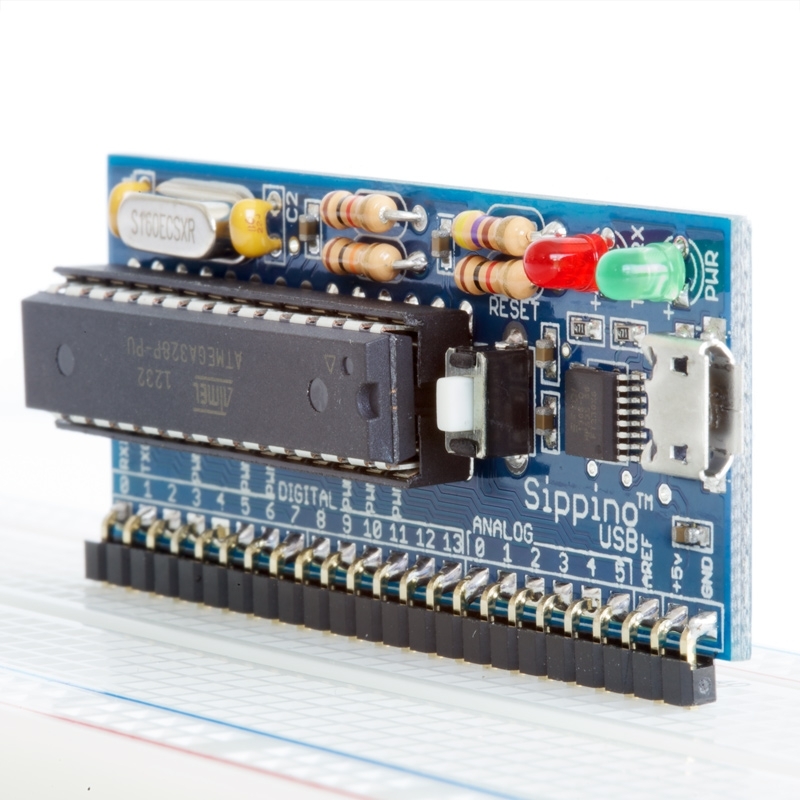 Unlike other small form factor Arduino compatibles which have pins spread around their edges, the SIPP feature makes the Sippino ideal for Arduino experimenting directly on a breadboard. All the pins are plugged in at once, with the standard 0.1" spacing. We love using Sippinos when we are developing new kits. 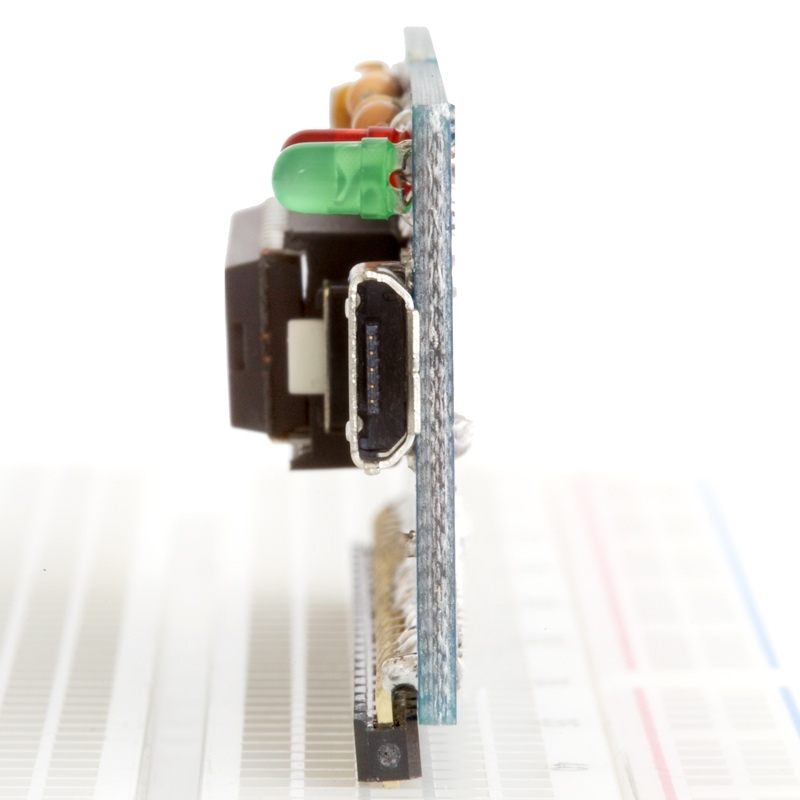 For us, the biggest advantage is not having jumper wires come loose from a dangling Arduino board. This is especially problematic when you're using many signal lines, and the Arduino is covered in weaving jumpers. 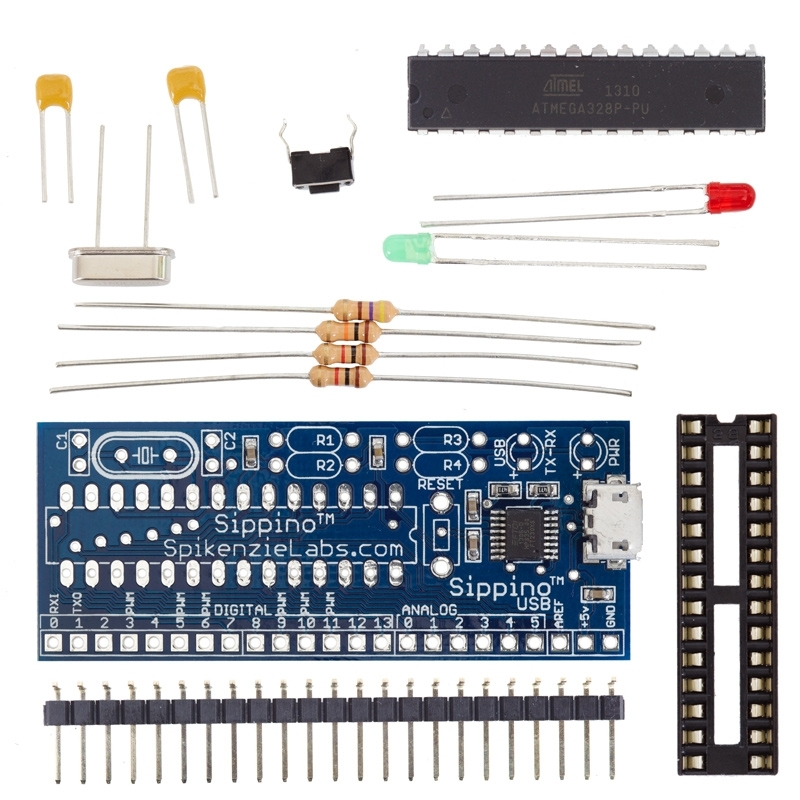 Since the Sippino is on the breadboard, you use less jumper wires, and spend less time debugging intermittent connections, or re-connecting a loose jumper in the wrong spot. Once you get your project working, you can kick it up a notch by simply transferring it to a permanent platform like the Shield Dock which is designed to work with Sippinos. If your project requires a shield, the Shield Dock holds the Sippino, and is pinned out for standard sized shields. Ships with headers to use it as a bottom, middle, or top shield. There is also prototyping space between and around the headers for your own through hole components and hard wired connections. 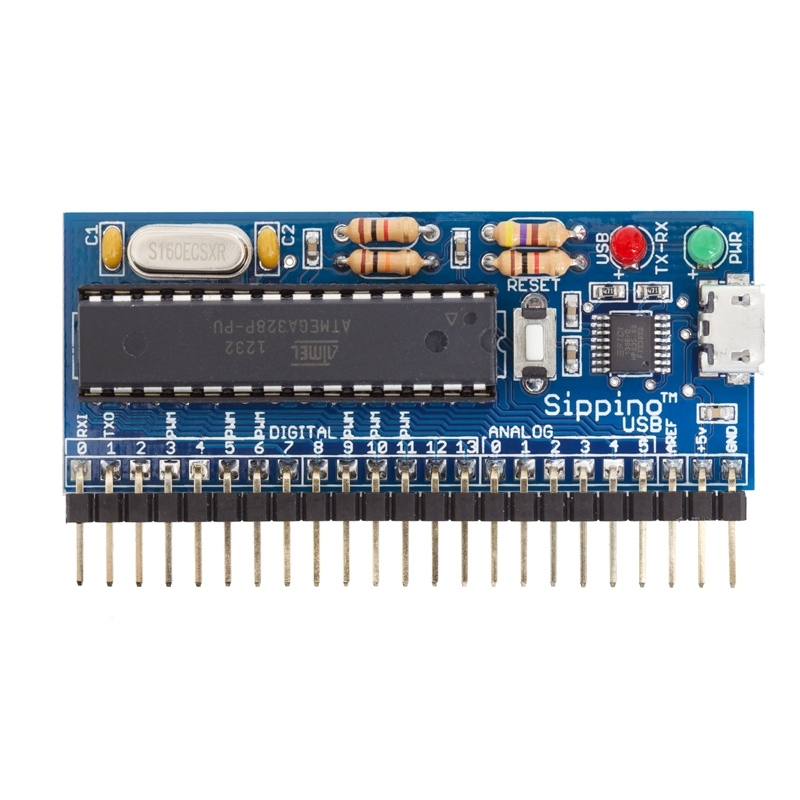 If you already have a USB to Serial adapter, or are ready to embed a Sippino into a project, you can save a few bucks by using the Sippino 328 which has the same signal pin-out. 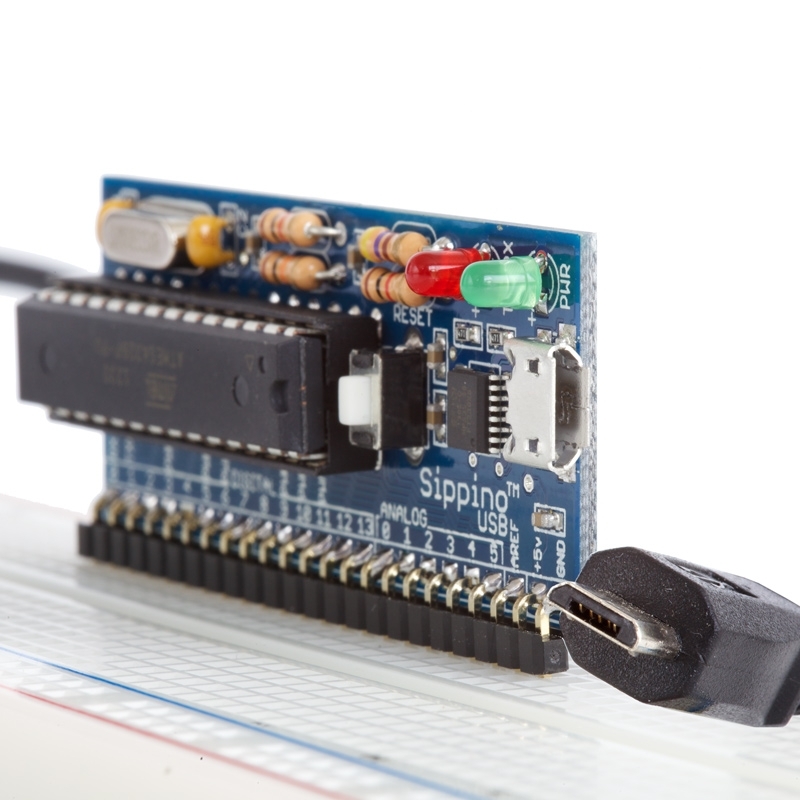 In place of the on-board FTDI chip and MicroUSB jack, the Sippino 328 has a standard FTDI pin header. Note: The surface mounts parts (FTDI chip, Micro USB connector, etc ...) come pre-soldered and tested. This is a kit and assembly is required for the through hole parts.